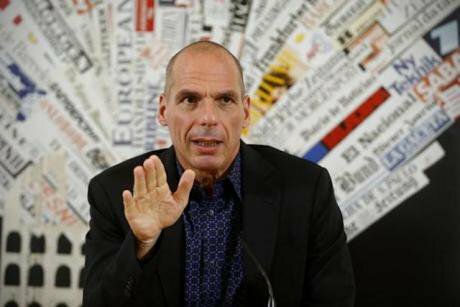 Yanis Varoufakis. Rome press conference announcement,October 26,2018. All rights reserved. The main reason why we are here today is because Italy is being torn apart by two destructive forces: one is Brussels and the other is Matteo Salvini: by the failed establishment of Renzi-Merkel-Juncker-Moscovici on the one hand, and by the reckless, racist anti-European Salvini project on the other. What we are doing as DiEM25 in Italy, in France, in Germany, in Greece, has to be seen in this context. Today Italy is ground zero of the European crisis. It may surprise some of you, but Brussels and Salvini are working very well together, as we speak, against the interests of Italians in particular and of Europeans in general. Salvini is Brussels’ greatest supporter. Mr.Juncker, Mrs.Merkel, Macron et al are hanging on to power with the argument: “Whatever mistakes we have made in Brussels, Berlin, or Renzi’s Rome, after us… comes Salvini. So you’d better support us.” And Brussels is also Salvini’s greatest supporter. By imposing on Italy rules that guarantee Italy’s stagnation and falling income and prospects for a majority of Italians, they enable Salvini’s sortie into xenophobic populism. Allow me to turn directly to the issue that concerns most of you here in Italy today, the clash over the Italian budget with Brussels. Our position at DiEM25 is that both Brussels and the Lega-5S government are profoundly, and intentionally, wrong. Brussels is wrong to impose on Italy fiscal and banking rules that guarantee Italy’s stagnation – rules that were agreed to by the now collapsing Italian establishment. The EU’s revamped fiscal rules are analytically baseless. There is no such thing as a structural deficit. It cannot be measured and it should not be measured. It is based on faulty economics. They are forcing Rome to introduce new austerity at a time when Italy’s growth has collapsed to almost zero per cent. If the Italian government, any Italian government, were to follow the fiscal compact and reduce the deficit to 0.8% (as the rules specify), Italy’s debt-to-GDP ratio would rise, not fall, as the result of the certain fall in GDP that would follow. You would have another recession. The Lega-5S government is wrong too. Its budget will not boost growth sufficiently to make a difference to most people, and the result would be a deficit overshoot without much benefit. Cutting the top tax rates, for example, will not boost growth: when the rich receive a tax reduction they either save it or take it to Luxembourg or to Switzerland etc. Even worse, both Brussels and the Lega-5S government know that they are profoundly wrong. Brussels is choosing to be wrong, because they are more interested in maintaining a semblance of control over our countries than they are in shared prosperity across Europe. And the Lega-5S government is choosing to be wrong, because Salvini and Di Maio are more interested in maintaining their precarious alliance that in the prosperity of the Italian people. So, here we are, facing this situation: Italy stagnates because its centrist establishment agreed to EU rules that choked Italy, causing its own political demise and paving the ground for Salvini. The ancien régime (including Renzi and his patrons in Brussels) and the Lega-5S government are two faces of the same debased coin. Brussels and Salvini will continue to reinforce each other while Italy sinks, while Europe disintegrates. One of the side effects, the collateral damage of this clash between Salvini and Brussels is that we have stopped talking altogether about the Eurozone reforms that are absolutely necessary to keep Italy in the eurozone, to keep Greece in the Eurozone, to keep the Eurozone sustainable – even the reforms that President Macron raised for discussion are now dead in the water. Italy’s oligarchic establishment (PD, Forza Italia etc.) caused the problem and today they cannot pretend to be part of the solution. Salvini is exploiting this fragmentation and logical incoherence of the establishment to bring, through his rabid xenophobia, a new fascist moment to Italy, while 5S is increasingly discredited as a crutch on which Mr. Salvini is leaning to take over government completely next year. We must act now! Italy has an urgent need for a new progressive alternative to the implicit but destructive alliance between the oligarchic establishment and Salvini’s nationalism. But what Italy, however, does not need from us progressives is yet another sad leftist alliance of the usual suspects. Italy does not need another Frankenstein leftwing list that stitches together the dead parts of what used to be Italy’s glorious left. The last thing Italians need is another list of leftist candidates lacking a coherent programme of change, a Europeanist programme of change that answers the questions: what do you do with the banks? What do you do with the public debt? What do you do with poverty, not only in Italy but also in France, in Germany, in Greece? This is why we are here today, to announce that we are going to put together such a list with a single, coherent and credible programme. You may very well ask, “and who are you?” Who are we who are going to do this? Last March in Napoli – I was there for DiEM25, with my colleagues from political movements and parties in Poland, Denmark, Portugal, my friend Benoît Hamon from France, together with Luigi Di Magestris, the mayor of Napoli – and we embarked upon this project of putting together a transnational list with a coherent programme across Europe. This programme is now complete after many months of very hard work. It is a progressive, ecological, feminist, humanist, rational programme of the pan-European coalition that we now call Primavera Europea, European spring. Because this is Italy where we now have a major political crisis, will you allow me to start with Italy. Let me remind you of the sorts of proposals that we are bringing to the table, that address the local, the national and the European at the same time. 1. The first thing we propose regarding the Italian budget is that a component of it that concerns a guaranteed minimum-income is introduced and indeed expanded, simultaneously. 2. Scrap Salvini’s top tax rate cut and the tax amnesties (including those to owners of illegally built housing). When you give handouts to the rich, as I said before, you are not boosting growth. We have known this for ever. Why have we forgotten it now? Replace those tax cuts (about 8 billion euros) with a growth-enhancing green investment. To this sum add another 12 billion euros, taking the deficit to the Maastricht limit of 3%. The total public investment of 20 billion euros would then be spent on: (a) industrial and ecological transition; e.g. to address problems such as ILVA in Taranto and the offshoring of low-added-value manufacturing; (b) environmental safety, including a plan for earthquake preparedness; (c) investment in infrastructure, to avoid a repetition of the Genoa disaster and to invest in sustainable transport. What about the fiscal rules of the European Union? Our proposal is that we go from 2.4 to 3% but in a growth-enhancing manner. If the European Union wants Italy to adhere to the fiscal compact, it can be done. Our proposal is that the Government of Italy calls for a European Union Council Summit to propose the following in order to reduce the fiscal deficit of Italy from 3% to 0.8%, even to 0 per cent. The European Union Council could give this the go ahead as a result of one simple decision. There is no need for any treaty changes whatsoever. They could give the green light to the European Investment Bank (EIB) that belongs to all EU member states, for issuing EIB bonds up to 5% of eurozone GDP each year for five years – this is about 500 billion euros – with the European Central Bank standing by in the secondary bond markets to purchase those bonds if their yields rise above a threshold, in the same way that it has been doing in the last few years. This way you boost public investment through the European Investment Bank, in Italy, in Germany, in Greece by 5% of GDP. Then you could have an Italian government which is reducing the Italian deficit down to the levels prescribed by the European Council and the fiscal compact. You can see that we are combining a solution for Italy with a solution for Europe. 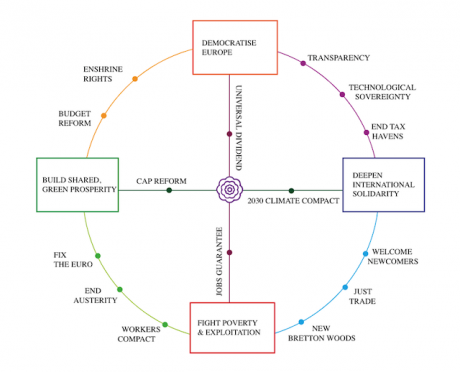 Europe desperately needs a large-scale green investment programme to create the good quality jobs that we are lacking throughout Europe where we are forcing our young people into precarious jobs as much in Germany as in Italy – a process which is only feeding nationalist internationalism, racism and xenophobia across Europe. We need to make this investment in the Green Energy Union that we do not have, for many reasons, for the planet’s sake, but also with the objective of becoming decoupled from Putin’s Gazprom. In this way in every country, we need to combine solutions at the pan-European level with solutions at the national and indeed the regional level. Ladies and gentlemen, austerity for the many and socialism for the bankers has given rise to the present fascist moment in Italy, to the collapse of the political centre everywhere, to the reactionary, divided Europe that Mr. Trump dreams of. Today, here in Rome we are saying, enough! We are saying another Italy, another Europe is not only possible, but it is here in the form of our transnational movement with a single coherent programme that people can believe in, in Italy, in Germany, in France, everywhere. What do we propose for the European Union? Talking about our next steps, we, DiEM25, are here as part of the process begun in Napoli in March of this year, with Luigi di Magestris, with Benoît Hamon of France’s Génération.s, with Denmark’s Alternativet Party, with Razem in Poland, with Livre in Portugal, with MeRA25, our new party in Greece, with green parties and leftists parties that we are talking to. But what is important is that we are not presenting to you here simply a list of people who want to be elected; but that our list should have one common, radical Europeanist programme, and that whoever wants to discuss this programme with us, which is at a very advanced stage – you can access the EUROPEAN SPRING’s comprehensive New Deal for Europe programme here that we shall present to European voters across Europe in May 2019 – can come along. European Spring's comprehensive New Deal for Europe programme. Such questions as “Are you with Mélénchon, or whoever?” – this is an old-style politics and not the one that the people out there care for. We are not interested in this. We are interested in solutions, and anyone who wants to join us on the basis of one programme for the whole of Europe that works for Italy, that works for Germany, can come with us and be part of this list. The European Parliamentary elections in May 2019 are only a start. They give us an opportunity to have this debate. We will use the May elections to transcend the fake conflict between Salvini and Brussels, between the authoritarian, incompetent establishment and the misanthropic nationalist international. DiEMItalia is here. We are moving up and down the country, and scheduling three major events in November, with the final one in Milano, to announce our list and begin our primaries. We shall begin collecting the signatures necessary to contest the May 2019 European Parliament election. We invite all the partners who embarked upon this journey with us last March in Napoli to join us, but there is no more time to waste. We are moving, and declaring our presence in Italy; then a similar announcement of a political party belonging to DiEM25 in Germany on November 24/25; in Greece we have already started, and in France. DiEMItalia is here, with an economic agenda, but also as a political force. We are here not only to contest an election, but to bring to the people of Italy the scent of next May’s European Spring and with it a message: Italian progressives are no longer alone!